In The Secret of Hoa Sen, Nguyen Phan Que Mai paints a series of intimate and deeply personal lyrical portraits of her country, her family and contemporary social concerns. The Vietnam war in this work is a scar, but it is only that. At the forefront and foundation of Nguyen’s poetry is her own story; one of family, self-discovery, social consciousness, healing, and rebirth. Members of the poet’s family appear throughout the book, first as caretakers and teachers in the fresh, exciting world that is her home village. Rituals of tedium and labor that, in themselves defy elegance, are made elegant in Nguyen’s verse: “That day in our kitchen/I saw how perfection was arranged/by soot-blackened pans and pots,/and by the bent back of my mother, so thin/she would disappear if I wept, or cried out.” In these first poems, the poet’s memory is a dreamscape of natural wonder and human kindness, observed with a poetic and feminine sensitivity that harnesses the imaginative power of childhood innocence. As an American reader, I find the unique insight Nguyen provides into women’s familial and community roles in the Vietnam of her childhood very valuable and interesting. 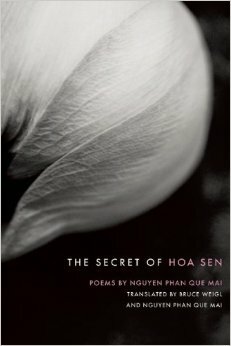 The self-discovery that Nguyen expresses in the subsequent poems is as tender and delicate as teenage love: “Side by side I sit with my love, by the garden of our longing;/our naked fingers dig deep into the earth.” This delicateness is evident in the title of the book, and in the poem with the same name (“Hoa Sen” in English means “Lotus”). Each poem betrays this delicateness, even as it handles indelicate themes such as war, and it becomes a testament to the overwhelming power of aesthetic beauty and heartfelt compassion: “Only the hoa sen/witnessed how I became/the flower/that trembled on the chest of light.” It is a tenderness that originates in the poet as she discovers herself, and as she discovers it to be not a weakness, but a strength. The poems in this collection, while distinctly personal, are so dependent on Vietnam’s natural beauty, its history, and people. Nguyen’s poetic attention is diverse and wide in scope, but never far from her country and family. In her speech at the 23rd International Poetry Festival of Medellín, Nguyen spoke about Poem Mountain in Vietnam’s Ha Long Bay, where a poem by the 15th Century Emperor of Vietnam, Le Thanh Tong, is carved into the mountain side. Reading this collection by Nguyen, one cannot help but feel that each poem is written into the Vietnamese landscape of the poet’s imagination. Not carved, but delicately inscribed; so as to preserve the beauty of a country whose wounds must not define it.